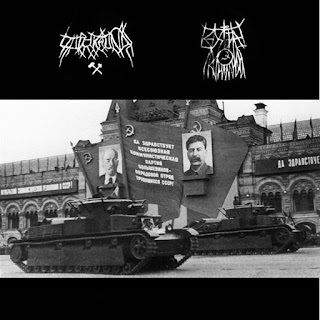 This is a review of a split ep between Italy's Red Star Kommando and Stupor Mundi which was self released in 2018 and we will start off the review with Red Star Kommando a musical project that plays a very raw and lo-fi form of communist black metal. Their side of the split starts out with a very raw sound which also uses a great amount of tremolo picking before speeding up and also adding in a great amount of blast beats while the vocals are done mostly in a deep black metal style which is mixed down low in the mix but having a bestial approach and the songs also bring in a great mixture of slow, mid paced and fast parts as well as capturing a lo-fi atmosphere and elements of noise, the production sounds very dark and raw while the lyrics cover Italian Communism themes. In my opinion Red Star Kommando are a very great sounding raw communist black metal solo project and if you are a fan of this musical genre, you should check out their side of the split. RECOMMENDED TRACK "Red Transnistria". Next up is Stupor Mundi a solo project continuing his raw and lo-fi style of black metal. His side of the split starts out with slow riffing before going into a very fast direction which also uses a great amount of tremolo picking while you can also hear the guitar picking along with the riffs also bringing in a small amount of melody as well as the vocals being mostly deep yet grim black metal screams and the second track is an instruemntal, the production sounds very dark and raw while the lyrics cover Communism, Marxism and Left Wing Politics. In my opinion this is another great sounding recording from Stupor Mundi and if you are a fan of raw black metal, you should check out his side of the split. RECOMMENDED TRACK "Inutile Stage'. In conclusion I feel this is a very great sounding split and would recommend it to all fans of communist, raw and lo-fi black metal. 8 out of 10.